A plumbing emergency can be a very tense, high pressure situation. Usually, there is water going everywhere and no way to stop it. 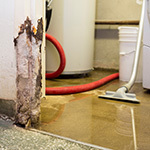 The tension and nervousness that a water leak or plumbing emergency causes comes from the fact that there a few forces on earth that can be as destructive as water. Water is powerful enough to carve the Grand Canyon out of rocks. Floods can devastate communities. Water is an amazing and elusive element. Plumbers have long tried to do the impossible, contain the uncontainable. Water is difficult to control and contain. It can change shape and squeeze through microscopic openings. Plumbing is the system that has been devised over many, many years to control water and put it to good use every day for a lot of people. Sometimes this force of nature gets loose and has to be put back in its place. 1. Know where your shut-off valves are located. Usually, but not always, the shut-off valves are located under a fixture. On a sink, the shut-off valves would be located under the sink attached to the hot and cold water lines. A shut-off valve for the toilet is located either on the wall behind the toilet or coming up from the floor next to and behind the toilet. Washing machines have shut-off valves as well. They are located behind the washer. The most important shut-off valve to locate is the main water shut-off. It will shut-off water to the entire house. These valves can be in a basement, a utility closet, or in a crawl space under the house. If there is a plumbing emergency with the water supply, the best action to take is to shut off the water either at the fixture where the leak is or shut off the water at the main shut-off. Call Mark Lindsay & Son Plumbing & Heating at 973-728-8900 to remedy the problem. 2. When it comes to a clogged drain there aren’t a large number of actions that can be taken. In order to minimize damage, all water usage must be stopped. The more water that runs, the more water will come back up. Call Mark Lindsay & Son Plumbing & Heating at 973-728-8900 to remedy the problem. 3. Although some people don’t consider gas leaks a plumbing emergency, most plumbing companies repair and install gas lines. This is a very dangerous situation. A. The gas should be shut-off. The gas meter is usually located outside of the house. The meter will have a shut-off on it. Turn the valve to shut-off the gas supply. B. Notify the gas company. They may have some extra instructions. C. Call Mark Lindsay & Son Plumbing & Heating at 973-728-8900 to remedy the problem. Mark Lindsay & Son Plumbing & Heating can also assist you with an insurance claim or the clean up process. Over the years we have successfully assisted our customers with obtaining the maximum homeowners policy limits when an insurance claim becomes necessary. We have also arranged for the proper cleanup and decontamination process for our customers when catastrophes strike. Call Mark Lindsay & Son Plumbing & Heating at 973-728-8900 and let us help you make a bad situation better.